I’ve been experimenting with the green garlic that I’ve been getting in my fabulous veggie box… it’s kind of like having fresh garlic, garlic scapes, leeks, and onions, all at the same time! 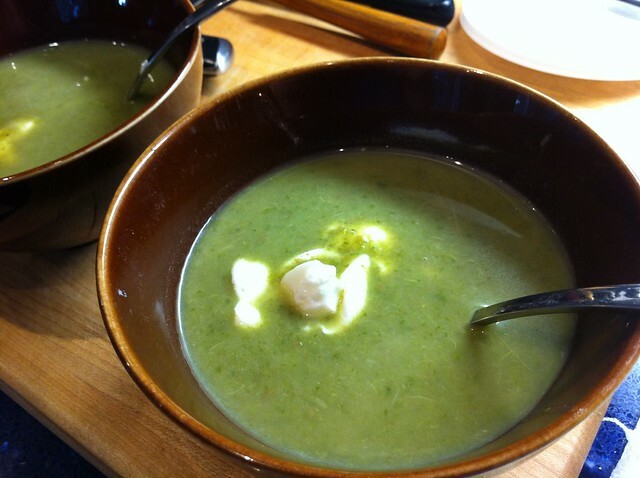 I used all of the parts of the green garlic in this soup and it was oh-so delicious and garlicky without being overpowering. And yes, you get a soup recipe in the middle of the hot summer. I adore summer soup — hot or cold. I also like hot americanos in the middle of the summer, so I might be weird on that one. I think this soup’s best served hot, but I also had some at room temperature and it was quite lovely. 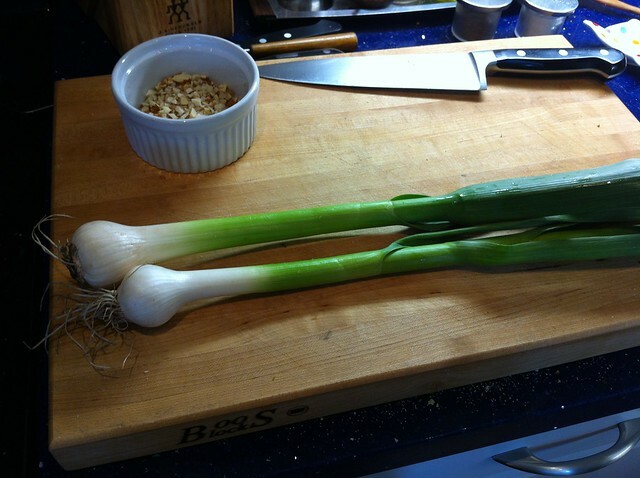 If you don’t have green garlic, I think you could use a bulb of regular garlic and a whole leek. But if you can find green garlic, it’s so worth it. It would also work with any greens you have on hand — I’d love to try a version with kale, or collard greens. Mmmm. Alliums and greens, how could you go wrong? In a large pot, heat the butter and the olive oil over low heat. Add the minced green garlic bulb and the sliced greens, along with the onion, and cook over low heat until softened. Add the stock and the brown lentils, and bring to a boil. Simmer for 10 minutes, then add the spinach and simmer for 1 minute more. Blitz using an immersion blender until smooth (or pour into a blender), and serve hot, topping each bowl with a tablespoon of yogurt (that may well sink to the bottom, but it’s still delicious). Enjoy all its garlicky goodness! Thanks for the soup recipe! It’s quite cold and wintery here in Cape Town. Perfect soup weather. I’ll definitely try it. Cape Town is one of my favourite places on earth. It makes me feel like I’m there a little bit to know you’re reading my recipes. Enjoy! So happy to have stumbled on your blog via Twitter. I’m fighting off a cold, and this looks like the perfect comforting soup for supper tonight. Thanks! Welcome! Hope you feel better soon and enjoy the soup!